Canada is a global mining giant. In fact, it is the world’s major force in mining, dominating the industry on every continent except Antarctica. Fifty-seven per cent of the world’s public mining companies list on the Toronto Stock Exchange, representing over 9990 mining projects world wide. This giant is growing. In 2007, the TSE financed mining companies to the tune of $17 billion. Supported by tax breaks and favourable legislation at home, and assisted by official development aid and diplomatic support abroad, mining companies have long found Canada to be *the* place to do business. Mining, however, comes at an often devastating cost to communities that lie in its path. As resource prices rise, so do the stakes; conflict is escalating. Canadian mining companies are heavily invested in Africa, and particularly in the DRC. Denis Tougis provides an overview of Canadian mining in Africa in Canada in Africa: The mining superpower. Canada’s image as a moderate country and disinterested development partner in Africa is now thoroughly outdated. The Congolese government surprised many when it announced early last year that it would be conducting a review of 63 mining contracts that were signed during the Second Congo War. The review aimed to revisit the conditions under which mining concessions and contracts were granted during the bloodiest years of the conflict, which is also known as Africa’s World War, during which as many as 5.4 million people have been killed since 1998. It is expected that the review will call for the re-negotiation of about 25 mining contracts and the possible cancellation of about 22 others. The release of the review was originally scheduled for October, but has been delayed since fighting broke out in the east of the country, displacing about half a million people. The Second Congo War was fueled in large part by a scramble for resources. The war involved eight African states, multiple rebel groups and several very powerful multinational companies, among them Canadian companies. The war officially came to an end in 2003; conflict remains prevalent throughout the country; and according to the International Rescue Committee, 45,000 people die each month from war-related causes. 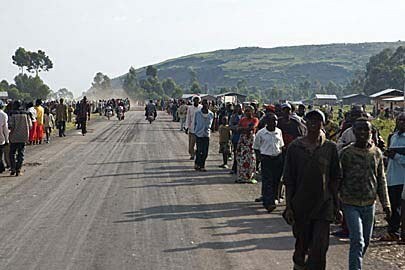 in June 2007 over allegations that they had provided logistical assistance and ground transportation to the Congolese Armed Forces during an assault on a fishing town called Kilwa in October 2004 in which 70 to 100 civilians were killed. According to a report by MiningWatch Canada and Entraide Missionnaire, the company’s vehicles were used, among other things, to remove corpses in the aftermath of the assault. Despite multiple eyewitness testimonies, the company employees were acquitted. The report revealed that in 2002, AngloGold Ashanti – a company partnered with Canada’s Barrick Gold – was negotiating with two rebel groups, the UPC (Hema Union des Patriotes Congolais) and the FNI (Front des Nationalists Integrationnistes) to have access to gold-abundant areas that were out of control of the central government in Kinshasa. At the time, these rebel groups were carrying out massacres of civilians in the hundreds; The UPC killed about 800 civilians from late 2002 to early 2003, while the FNI forces killed some 500 civilians in May 2003 in a “48-day war.” In return for granting concessions to the company, the FNI were provided with logistical, transportation and housing assistance. Moloo’s article was written this November. One has to wonder about the timing of the recent escalation of violence. What is the relationship between the October escalation of violence and the planned October release of the review of the mining contracts? Moloo has also written an excellent history of mineral exploitation in the Congo: The Democratic Republic of Congo’s Economic War: Investigating the Origin of Anonymous Commodities in the Global Capitalist System. According to Alain Denault, author of ‘Noir Canada: Pillage, corruption et criminalité en Afrique’, Canadian mining firms operating in Africa are involved in levels of abuse worse than those perpetrated by the former colonial empires. Today, Canadian firms own in excess of $300 billion worth of assets in the DRC, most of it acquired through dodgy contracts signed with mining parastatals. 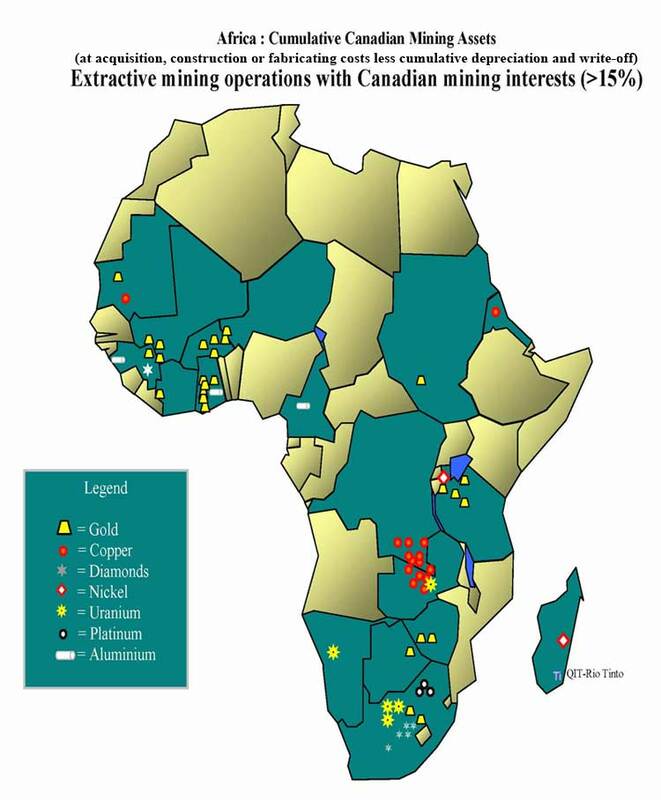 Approximately 60% of mining companies operating in Africa are Canadian-owned or funded with Canadian capital. Everywhere that mining takes place in Africa there are serious problems. These challenges are not only socio-economic. They are also ecological, and the impact on human rights. Obviously, Africa does not deserve that which is good for Canada, an attitude which seems to pervade the decisions and actions of companies operating in the continent. One wonders why the legal and moral obligations that apply to mining companies in Canada are not applicable in the tropics. It is obvious that the mining companies’ primary objective is profit. But this should not preclude the respect for the engagement conditions of host countries. These companies largely resort to means that would be scarcely acceptable in Canada: rapacious financial practices, human rights violations, violations of ecological standards, stockpiling of undervalued resources. All of these place the future of Africa at risk. CLICK HERE, to view the live and interactive version of this map. You can also view maps of hijackings & attempts in Somalia: nato from nov 18, unosat from oct 2 (h/t b real). One thing is clear on the African portion of the map. The attacks occur in the regions where war and resource exploitation have made it impossible for local citizens, particularly fishermen, to make a living, the Niger Delta, portions of the Gulf of Guinea, and Somalia. In Somalia, illegal overfishing in Somali waters by the European Union and some Asian countries has fished out the waters. Many fishermen have turned to piracy as an alternative occupation. Likewise in the Niger Delta the pollution and exploitation of the oil companies, and the illegal fishing, have destroyed the fish and put local fishermen out of business. For more about who can stop the pirates in Somalia, see my earlier post. Is Somalia now a private hunting reserve for the US? Has Somalian wildlife been enlisted by al Qaeda? 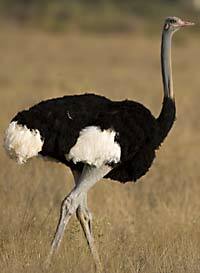 Are the ostriches and oryx harboring terrorists? Or is Somalia just on the receiving end of another form of piracy? People living along the pirate-infested central Somalia coastline have been scared by helicopters bearing US flags. The US troops in Somalia are now hunting the country’s wildlife under the guise of fighting pirates or protecting the Somali coastline. The environmentalists have especially pointed their finger of blame at the administrations Some Somali regions of exporting the illegally commodities and the national properties those are reportedly signed private contracts with foreign agencies. They have threatened that everything is now being recorded and one day those responsible and those giving them the facilitation for the export will be brought before the justice. “Three helicopters landed three separate days,” said elder Mohamed Hussein Warsame, quoting witnesses and community leaders. Soldiers jumped out of the helicopters and loaded live animals, including deer and ostriches, the he added. The helicopters then returned to a warship off the coast. Mr. Warsame said the foreign soldiers used a technique to subdue the animals, some of which are extremely fast and agile. He indicated that the identity of the warships remained unknown, but that locals have reported seeing the American flag hovering above one of the warships in the distance. Foreign warships from a number of countries, mainly in the West, are patrolling Somalia’s waters in an international anti-piracy campaign. Since 1991, when the country’s last government imploded, Somalia’s long and unprotected coastline became subject to illegal practices including overfishing and toxic waste dumping. Is this one of the benefits to local people of “nation building” and “peace keeping” in the “ungoverned spaces”, to be robbed of your wildlife heritage? NAIROBI, 22 October 2009 (IRIN) – Authorities in the self-declared autonomous region of Puntland, northeastern Somalia, are compiling data on foreign helicopters said to be poaching and stealing wildlife from the area while at the same time scaring off the farm animals. “We have been getting reports in the past few months of unidentified helicopters swooping in from the sea and attacking and taking wildlife,” Abdiqani Yusuf Ade, Puntland’s Environment Minister, told IRIN. He said the helicopters scattered the wildlife and once they had landed, two or three men captured the animals. He said the most common game in the area was gazelle and ostrich. Yusuf said the noise of the helicopters was affecting the local population and their livestock. Many were lost after being frightened by the planes and stampeding. He said some had been eaten by predators. “We have forwarded our complaints and what information we have collected to the Puntland government,” Yusuf said. Ahmed Aden, an elder in Garad town, 5km south of the area, told IRIN the helicopters came from ships that could be seen from the land. Aden said because the area was flat and grassy, it was easy for the helicopters to land. He said the dust raised disoriented the animals, allowing the men on board to capture them. 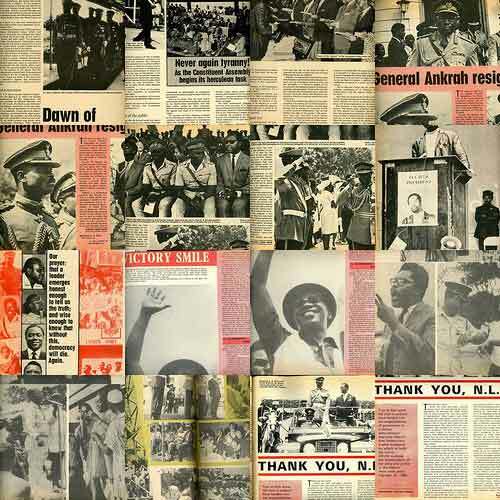 Koranteng has scanned pages and written some commentary on issues of Ghana’s Drum Magazine from 1969. You can read his excellent commentary and view some of the pictures at Koranteng’s Toli. You can also see a slideshow here of pages he has scanned. This is a lot of fun to view, for people who remember those times, and for younger people who are interested in their history. The public/private conundrum is very much in the news in today’s Ghana, private schools are all the rage, often funded by churches. The jury is still out as to their effectiveness and the question of standards; the Ministry of Education still has to reconcile unyielding demand for public education with limited resources; worse, everyone has an opinion. The easiest way to get any Ghanaian talking for a good hour is to broach the topic of education, we all wax eloquent about what is to be done. The political collage at the top of this post is from his slideshow. More typical of the magazine might be the pretty girls on the covers, or the collage of advertising. But I tend to be a political history buff. Koranteng is a perceptive observer of social history, I recommend you read his commentary. France 24 has been doing a good job of covering the recent violence in the DRC. 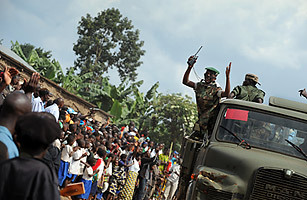 The first third of their weekly video report deals with the DRC and is here, Fleeing North Kivu’s Combat Zone. There is also this video report, Leaders to meet as thousands flee fighting. In the first of these the usual “ethnic conflict” reasons are trotted out, but they also get to the conflict over natural resources. 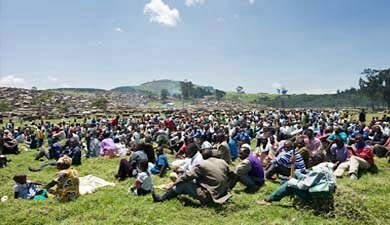 The AP finally reports the conflict as being over minerals Mining for minerals fuels Congo conflict. “Basically, the rebels control the mines. They are selling them to middlemen who sell them to the next buyer and it goes up the chain,” he said. The illegal mining has been a huge windfall for Rwanda and Uganda. The two countries have very few mineral reserves of their own. But since they began extracting the DRC’s resources, their mineral exports have increased dramatically. … The International Monetary Fund (IMF) and World Bank have knowingly contributed to the war effort. The international lending institutions praised both Rwanda and Uganda for increasing their gross domestic product (GDP), which resulted from the illegal mining of DRC resources. So it Rwanda has very little incentive to promote or make peace in the DRC, and plenty of incentive to keep the conflict going. Getting out of the DRC would mean a downturn of Rwandan GDP. As Paul Rusesabagina says, “Nkunda is on a mission“. His mission is to maintain control of the illegal mining and its profits for the benefit of Rwanda. Another question asked on France 24 is what is the relationship between this sudden increase in violence, and Chinese plans for mining and building infrastructure in the eastern Congo. The violence and potential for more violence is greater than ever, as France 24 reported via Uruguay on November 1. The rebels troops led by ethnic Tutsi warlord Laurent Nkunda “are backed by tanks” and “artillery” from Rwanda, according to Uruguayan military commander Jorge Rosales, who is overseeing the peacekeeping troops. The rebels have also recently attacked camps for people displaced by the conflict, UN officials reported. “These (rebel) troops are backed by tanks, something that General Nkunda had not had until now,” said Rosales. Uruguayan peacekeeping troops have been attacked with “artillery fire,” and, Rosales said, “Nkunda has also not had artillery” until now. Some 629 Uruguayan peacekeepers are in Goma, along with 700 peacekeepers from India. Rebel forces are within two kilometers (1.6 miles) from the UN peacekeepers, eight kilometers north of Goma, said Montevideo. The peacekeeping forces are in the DRC working secure the area and protect civilians, as well as United Nations personnel and facilities. I saw another video report on France 24. I can’t find the link, but it interviewed one of Nkunda’s staff who was claiming we are just here to protect… and that the people were joyful to see them. It also showed footage of a celebratory demonstration of “support” that local people were forced to make by Nkunda’s soldiers. (The photo above may be from that.) You could tell by the expressions on people’s faces that nobody was happy to be there. It sounds like Rwanda is pouring more and heavier arms into the DRC. Who is paying for these tanks and artillery? They were not there before now. 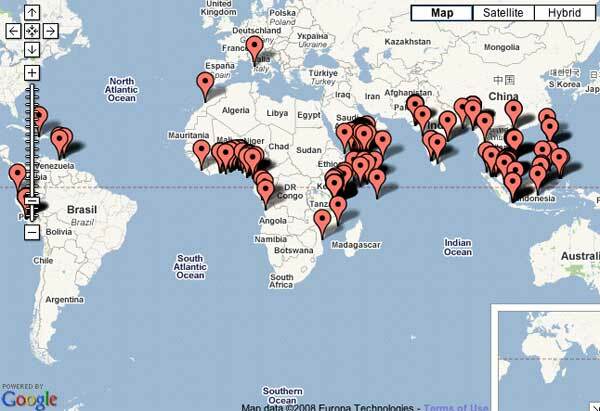 Keep in mind Rwanda has been a big recipient of US military aid for the “War on Terror”. In the DRC it is the War of Terror.